Kamar Baldwin drives to the basket. Baldwin scored 18 points in the win. Jimmy Lafakis/Collegian file photo. The Butler men’s basketball team picked up its second win in a row, knocking off Georgetown on the road, 73-69. It was the Bulldogs’ fourth straight victory over the Hoyas in Washington D.C. Here are three takeaways from Butler’s most important win of the season. 1. Offensive rebounds kept Georgetown in the game. Of the Hoyas’ 35 points in the first half, 11 of them came from extra possessions off of their six offensive rebounds. In the opening 20 minutes, the Bulldogs shot nine percent better from the field and 15 percent better from three. They won the bench battle by 10, got eight fastbreak points and committed one less turnover than Georgetown. Butler still only led by six because of the Hoyas’ 11-0 edge in second-chance points. Georgetown only managed 45 points from its first shots, a testament to how effective the Bulldogs’ defense was. The other 24 were the result of 15 offensive rebounds. Guarding well doesn’t matter if the possession doesn’t end in a rebound. When Butler shoots 44 percent from the field and goes 10-of-26 from deep while being this good defensively, it should win by 15, not four. There are few things more infuriating for a basketball coach than not boxing out after doing everything right on defense. This game is why. 2. Everyone pitched in for Butler. Three players — Mac McClung, Jesse Govan and Jamorko Pickett — contributed 32 of Georgetown’s 35 first-half points and 74 percent of their total in the game. Meanwhile, six players were in the scoring column for Butler 10 minutes in. Seven Bulldogs scored at least five points, led by Kamar Baldwin’s 18. Butler’s starters combined for 51 and the bench added another 22. The 21 points from Jordan Tucker and Paul Jorgensen in the first half kept Butler’s offense rolling despite Baldwin only adding five. It was an incredibly encouraging sign that everyone else was playing well enough to make Baldwin’s quiet half a non-factor. It’s not a coincidence that Butler’s improved play has coincided with a rejuvenated Jorgensen and more balanced scoring attack. 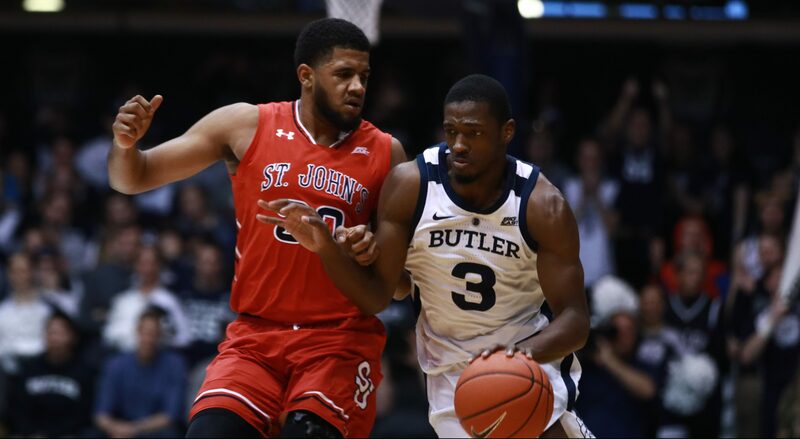 Butler isn’t winning Big East games with only one or two guys playing well. These last two wins have been collective team efforts. 3. This could be a season-defining win. All of a sudden, Butler is tied for third place in the Big East, even with its 5-6 conference record. Assuming the Bulldogs take care of business at home the rest of the way, one more road win and a decent showing in the Big East Tournament should be enough to reach the Big Dance. The narrative surrounding the rest of Butler’s season looks completely different if it doesn’t hold on to beat the Hoyas. Still, there are too many games in a college basketball season to get too high or low after any of them. The world wasn’t ending when the Bulldogs were 3-6 in Big East play and they still have plenty of work to do now. Butler takes control of the race for third with a win at St. John’s on Feb. 12, especially with a home game against DePaul coming next. At least three Big East teams are making the NCAA Tournament. The win over Georgetown puts Butler firmly in the discussion with seven regular season contests left.